Screening shifts the balance of breast cancers from mainly palpable to mainly impalpable. Randomized controlled mammography screening trials have unequivocally demonstrated the following. Screening for breast cancer can prevent death from the disease. Breast cancer is not a systemic disease from the outset. Breast cancer is a progressive disease, but progression can be arrested by early detection and treatment at a sufficiently early phase. The major factor determining the final outcome is the timing of treatment relative to the natural history of the disease, rather than the choice of treatment offered to breast cancer patients. Because breast cancer is not a systemic disease from inception, when it is detected as either an in situ or a 1 to 14 mm invasive tumour it is primarily a surgical disease. The revolution in detecting breast cancer at these early stages awaits a similar revolution in therapy. The mammographic screening trials have clearly demonstrated the life-saving effect of early breast cancer detection and removal, combined with reduced need for adjuvant treatment regimens. Despite the excellent prognosis of most patients with small breast cancers, a small number of women still die from tumours of 1 to 14 mm a few years after diagnosis. When searching for features that are common to these rare fatal cancers, neither axillary node status nor histologic malignancy grade could reliably discriminate fatal cancers from those with excellent prognosis. We have found the mammographic image to be a reliable reflection of breast structure, although it tends to simplify the histological heterogeneity of breast cancer to five mammographic tumour features (Figure 1) . Analysis of these features shows them to be reliable additional prognostic tools for predicting the long-term outcome of early breast cancers [2–4]. The five mammographic prognostic features. Although axillary node status and histological malignancy grade are established and reliable prognostic factors in tumours larger than 20 mm, the predictive value of these factors is reduced at sizes under 15 mm. Tumours that present with casting type calcifications on the mammogram have exhibited a surprisingly poor outcome, even when they are node negative, which demonstrates the prognostic value of this particular mammographic tumour feature when estimating patient outcome. Also, the diminished reliability of the histological malignancy grade was demonstrated in a series consisting of 440 consecutive cases of 1 to 9 mm breast cancer in women aged 40 to 69 years and followed up for as long as 26 years. There was a significantly poorer long-term survival in women with grade 2 invasive breast cancer than in those with 1 to 9 mm grade 3 breast cancers. However, the addition of the mammographic tumour features allows us to divide the grade 2 tumours into two subgroups that have vastly different outcomes. Women lacking calcifications had 100% long-term survival, whereas the association of extensive, grade 3 in situ breast cancer presenting on the mammogram as casting type calcifications with 1 to 9 mm grade 2 invasive breast cancer led to a surprisingly poor long-term survival [2–4] (Figure 2). The influence of casting type calcifications on survival. 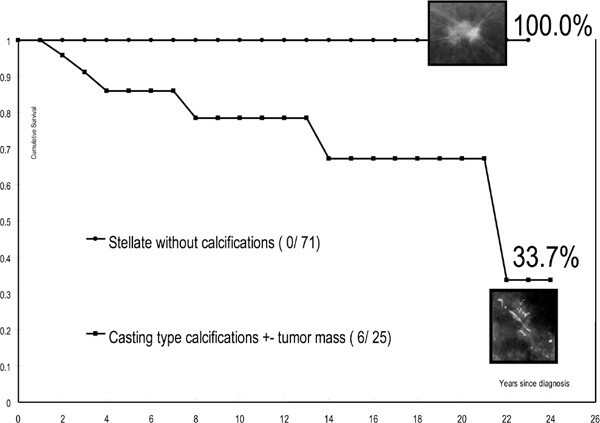 Shown is the survival of women with 1 to 9 mm grade 2 stellate tumours with and without associated casting type calcifications. The integration of mammographic tumour features into the TMN staging system should enable practising physicians to distinguish more accurately between the 1 to 14 mm breast cancers with extremely good long-term prognosis and those cases with unexpectedly poor prognosis, allowing them to use more specifically targeted therapy and to avoid overtreatment. The 26-year survival rates of women with 1 to 9 mm and 10 to 14 mm invasive breast cancers associated with casting type calcifications were 49% and 54%, respectively. 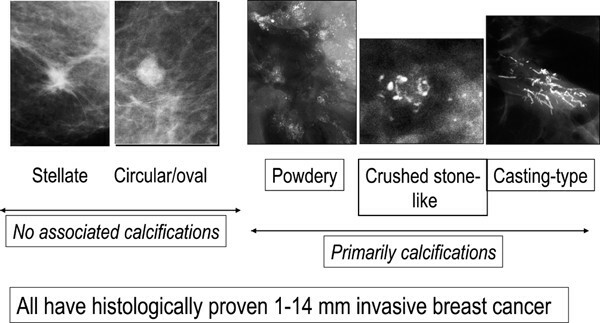 This finding suggests that 1 to 14 mm breast cancers that are associated with casting type calcifications should belong to a more advanced stage category that reflects their clinical behaviour. The casting type calcifications are found within the abnormal, closely packed, contorted, newly formed ducts, which we consider to be duct-forming invasive carcinoma and have termed 'neoductgenesis' [2, 3]. It appears that vascular intrusion may occur during this process of neoductgenesis, leading to histologically demonstrable extensive lymphatic and/or haematogenous spread. On the other hand, stellate/spiculated 1 to 9 mm tumours without associated calcification, which comprised the largest group (50%) in this size range, had the greatest long-term survival (99%). After exclusion of 1 to 9 mm cancers associated with casting type calcifications, the remaining cancers have extremely good prognosis when they are treated with surgery alone. Adjuvant therapeutic regimens offer little to no benefit to these patients and have the potential for causing harm [2, 5]. The mammographic tumour features can serve as independent predictors of long-term outcome in screen-detected 1 to 14 mm invasive breast cancers. Modern imaging tools, breast magnetic resonance imaging included, are of great value in preoperative mapping of the true extent of breast cancer, and they are an essential component of treatment planning. Adequate correlation of imaging findings with underlying histology requires large thin section and large thick section, subgross (three-dimensional) histological examination. Large section histology permits the examination of about 65 cm2 of contiguous tissue; in comparison, standard glass slides cover an area of only about 5 cm2, greatly limiting reliable evaluation of tumour size and extent. The piecemeal reconstruction of a tumour's size, shape and margins, which every pathologist must do mentally, can hardly be considered to have a realistic 1:1 correlation with modern imaging methods, such as mammography, breast ultrasound and magnetic resonance imaging. Also, less than 20% of the specimen's margin is examined when the conventional, small block histology technique is used (Tucker L, personal communication). Large section histology leads to a more accurate documentation of the main tumour and the surrounding tissue, which may contain additional invasive and/or in situ cancer foci and permits more accurate assessment of the margins . The correlation of modern imaging techniques with large section histology will lead to a considerably improved mapping of disease extent, which in turn will result in more appropriate treatment, fewer recurrences, and consequently better patient care. Palpable breast cancers that recur locally tend to have poor survival. Experience with such tumours has given physicians an ingrained fear of local recurrence, but radiotherapy has its own risks . However, the harm/benefit ratio of adjuvant radiotherapy increases with decreasing tumour size. Randomized controlled trials evaluating the impact of postoperative radiation therapy on both local recurrence and long-term survival in mammographically detected, under 20 mm, node-negative, unifocal breast cancers have demonstrated that the addition of radiotherapy made no difference to long-term outcome. Using these selection criteria, radiotherapy was found to have no impact on breast cancer survival in the Örebro-Uppsala trial, despite a 15% higher local recurrence in the non-irradiated group of patients . Further confirmatory data have been reported [8, 9]. Because the vast majority of screen-detected breast cancer cases are unlikely to benefit from postoperative irradiation, it is important to define this subgroup of patients. Use of mammographic tumour features plays an important role in this selection . In screen-detected breast cancers, when local recurrence is also found at regular surveillance it has no negative impact on long-term outcome. Population-based mammography screening has brought about a paradigm shift in our approach to the diagnosis and treatment of breast cancer. The spectrum of the disease has shifted from primarily palpable, advanced cancer to mainly impalpable tumours that have exceedingly good prognosis. The traditional emphasis upon applying therapeutic regimens designed for advanced disease should give way to a new emphasis upon less radical and tailored treatments, whenever disease progression to advanced stages has successfully been arrested through early detection.